Folegandros island is located in the west of the Aegean, between the islands of Milos and Ios. Its key location allows visitors to easily travel to nearby islands of the Cyclades like Amorgos. The direct ferry from Folegandros to Amorgos departs daily during the summer season and it takes around 2 hours. There is also the option to travel indirectly from Folegandros to Amorgos by catching a ferry connection from Naxos, Mykonos, Koufonisia, Milos, Ios or Paros. The cost of your ferry trip will depend on the itinerary that you choose and the type of vessel that you travel with. An indicative price for a direct ferry option from Folegandros to Amorgos (based on 2019 data) starts from €69. How long is the ferry trip from Folegandros to Amorgos? Folegandros is located 140 km (87 miles) away from Amorgos. The direct ferry that serves the Folegandros - Amorgos route is usually a high speed vessel so the trip lasts a bit more than 2 hours. How can I get from Folegandros to Amorgos? The Folegandros - Amorgos ferry route is served by both direct and indirect connections. Direct ferry from Folegandros to Amorgos: During high season (June to September) there is usually a direct ferry from Folegandros to Amorgos once a day. The direct ferry trip Folegandros - Amorgos last around 2 hours. Indirect ferries from Folegandros to Amorgos: You can easily travel from Folegandros to Amorgos with an indirect ferry connection throughout the whole year, but with more frequent itineraries in the summer. The indirect option means that you will have to get a ferry from Folegandros to a stopover island like Koufonisia, Milos, Mykonos, Naxos, Paros or Ios and from there another ferry to Amorgos. The indirect ferry option takes longer to get you from Folegandros to Amorgos but gives you the opportunity to visit for a few hours some of the most beautiful Greek islands! The minimum layover time when travelling indirectly from Folegandros to Amorgos is around 8 hours (according to 2019 data). The direct ferry from Folegandros to Amorgos usually arrives at the port of Katapola. If you choose an indirect ferry route from Folegandros to Amorgos then your ferry might be arriving either at the port of Katapola or at the port of Aegiali (north of the island) depending on the itinerary. We would therefore recommend that before you plan your holidays or your stay in Amorgos you check in which port your ferry arrives. The port of Katapola is located about 40 km away from the port of Aegiali and there are regular bus services that connect the two ports as well as Chora. On Ferryhopper you will find all available ferry schedules from Folegandros to Amorgos as well as all the necessary information about your departure from and arrival in your chosen destinations. The direct ferry from Folegandros to Amorgos often stops in Santorini on its way to Amorgos. For that reason the tickets to this ferry route might sell out fast, as in the summer many travellers want to visit Santorini, even for 1 day. We would therefore suggest that you book your Folegandros to Amorgos ferry tickets at least 3 months in advance in order to avoid any inconvenience to your summer holiday plans. Amorgos has two ports, the port of Katapola in the south west side of the island and the port of Aegiali in the north side of the island. 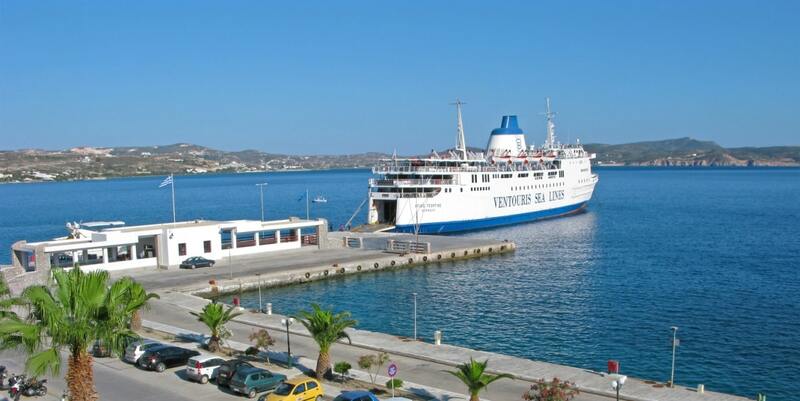 Both ports serve multiple ferry routes from nearby islands like Naxos, Mykonos, Koufonisia, Paros, Santorini or Ios. If you take a direct ferry from Folegandros to Amorgos you will arrive at the port of Katapola, however if you choose the indirect ferry option you need to check at your booking details which is your port of arrival to avoid any confusion. The weather in the Aegean sea is usually sunny and hot during the summer however it is often the case that it gets windy. This means that your ferry ride from Folegandros to Amorgos might get bumpy but there is nothing to worry about really...This ferry trip is short and in the chance that you get travel sickness you can ask the ferry crew for an aspirin or an anti-nausea tablet. If you are planning to take your car or motorbike from Folegandros to Amorgos you should probably consider the indirect ferry option. This is because usually the direct ferries that operate in the Folegandros - Amorgos route are high speed ones that do not carry vehicles. Amorgos is a beautiful island and you might want to consider staying a bit more than 1 night in the island. If you do, it would be worthy to rent a car or a motto to wander around Amorgos villages and beaches. From the island of Amorgos you can easily get cheap ferry tickets to the Small Cyclades, and get the change to enjoy the crystal clear waters of Koufonisia, Irakleia, Donousa or Schoinoussa. Check our easy-to-use Ferryhopper search engine and find all the direct and indirect ferry connections from Folegandros to Amorgos as well as all the itineraries from Amorgos and start your island-hopping in the Cyclades as soon as possible!